IMPORTANT NOTES, PLEASE READ: We’d love to have you stay at Friends Camp during your trip to the Common Ground Fair! Staying with us may not be for everyone– our cabins are RUSTIC summer camp cabins, with thin camp mattresses and no insulation. Our meals are offered dining-hall style, and cabins are shared if you have a group of fewer than 3 people. If you’re ready to rough it and meet some new people, then read on! For the 2018 Fair we will offer lodging on September 20th, 21st, and 22nd. Click here to sign up after August 15th, 2018. Friends Camp offers overnight lodging, breakfast and dinner on Thursday, Friday, and Saturday nights of the Common Ground Fair weekend, which is always the third weekend after Labor day. Groups of 3 or more people will have their own cabin; if you come solo or with one other person, you will be assigned to a shared cabin. Please bring sleeping bags/bedding and pillows. Friends Camp is 19 miles from the fair. We offer a few cabins with bathrooms and fourteen rustic cabins with bathrooms that are nearby. Bath house facilities offer hot showers and toilets. We have room for a few people to pitch tents or park campers; this is a good idea if you’d like a little more privacy. Friends Camp is non-smoking and alcohol-free. Pets are not permitted. We offer a simple dinner and breakfast for each night you stay. The continental breakfast buffet will be served from 7:30- 8:30 am, and dinner is served from 6:00-7:30 pm. We are not able to keep food if you arrive late or serve breakfast early. Meals are included in your stay at Friends Camp. Please note that there are no discounts for lodging without meals. Teen/ Adult (over 12 years old): $40 per person, per night. Child (Under 12 years old): $30 per person, per night. We have just a few cabins with a bathroom inside, so let us know if you are interested in that option. We try to save them for folks with accessibility needs. Teen/ Adult (over 12 years old) : $35 per person per night. Child (Under 12 years old): $25 per person, per night. 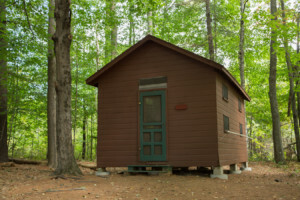 Please arrive at Friends Camp between 2 PM and 9 PM to get your cabin or tenting assignment. If you arrive after 9 PM please visit the Big Bird Dining Hall registration desk to find cabin or tenting assignment. Please clean out your cabin or tent or RV before 2 PM on the day you are leaving. If you cancel your reservation prior to September 10th for any reason, you can request a full refund. No refunds will be given to anyone who cancels on or after September 10th. Click here to sign up, after August 15th!